For those who have wish Mardan Mamat well in his 20 under win last weekend. He would like to thank you for your support. Mardan flew off to Thailand yesterday morning to play in the King's Cup at Khon Kaen to play on a course that suits his play. For a sportsman who have struggled for a large part of the season for reasons that few would know (and not because of his fitness, mental or self-belief), it is truly great to see him come back with a big win for his country, friends, sponsors, family and himself. All this with no grant, incentive or support unlike the other mainstream sports programme. He is truly the Champion, Man of the Moment and a sporting figure for those who wants to learn the Art of Winning. Thank You Mardan for making us proud to be a Singaporean on Sunday!!! And Thank You Kunnasak Yosintra﻿ for the photo. Congratulations and well done Mardan!!! You have done Singapore proud and wishing you more success in the new season. Impressive win by a deserving and very humble golfer. Keep it up Mardan. We are all rooting for you! Madame Tussauds Singapore should have a wax figure of Mardan Mamat as well. 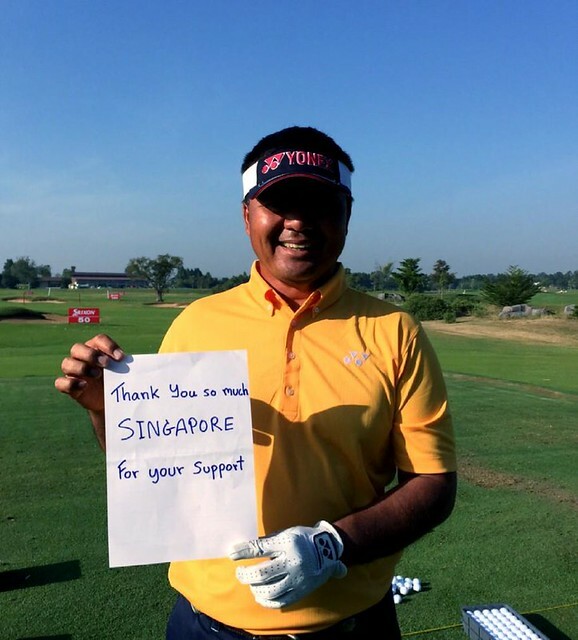 Well done MM, you did Singapore and her golfing community proud! All the best in your next tournament... More wins to come!! Help me understand why he can't get a corporate name on his bag please. Didn't he also finish 2nd in the Welsh Open? Isn't he worthy of a sponsor? Congrats Mardan! Congrats Mardan!!! Keep it coming!!! Maybe MM needs a manager to help him market himself. Just get to the point like me..
i told him many times....if you are a Chinese, you will have all the big brands on the sleeve. At least Danny Chia has Maybank...we are all adults to understand that and he agree with me. My idealistic hope of a Singaporean Singapore dashed when reality bites. Its the golfers out there who root for him that makes the day special for him. So this is to thank you all for your well wishes. If only sponsors do it because they believe in the man and not because they want to sell more products. The last sponsor who did it for him a big way has been Pan-West during Dato Loh stewardship. For Yonex, its a commercial arrangement and i know the local sponsor has done their best. Golf is seen as an elite sports and the sponsors have different agenda on sponsorship...mostly to sell more products or create more brand value with the association. i am sorry to be blunt but reality hurts. Its like someone coming up to me when i was helping Yash Majmudar on his game. They asked me why i was helping Yash who is a PR from India. My answer was simple, i only see golfers, not race, religion or where they come from. Man of the moment is MM, so let's just celebrate his success. I hope he will continue to win many more trophies and Sg golf can produce more winners like him in the pro circuit. And btw, had enough of seeing hidden buayas "winning" as amateurs. the view on a golfer should be based on his/her potential in the game, as well as his/her attitude towards improving the game of golf. Winning, or near to winning, has a lot of variable factors. I too would like to see more local lads make it in the Asian tour. Truth in what DG stated, and in part its also due to what all potential sponsors want - ROI (return on investment). A younger athlete represents a safer investment compared to a matured one, simply bcos he has a longer career ahead (all things being equal), therefore a willingness on the part of corporates to invest. Well nothing is ideal in this world, and so long as one is realistic, contented, healthy, and doing what they love most, all's good! Mardan Mamat, Singapore is proud of you and so am I!!!! Mardan was so happy with the response he is getting on the BFG FB, he did a second take this morning. 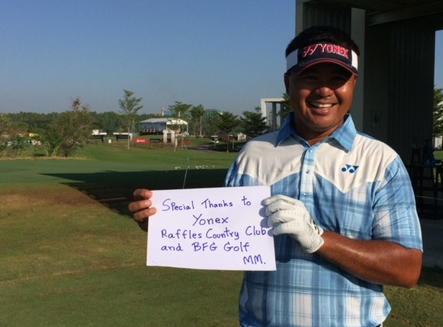 He told our partner Kunnasak that he would like to extend his thanks to the Sponsor, Club and Fitter. Just wanted to add that he is a true professional who will always be there to greet and talk to golfers. Those who have seen him at the Den will know that. Many country clubs have approached him to join their club but he will not be tempted even if the facilities are better. He is just loyal to those who work with him. no more photos this week, unless he wins on one of his favourite course in Thailand....and i will not be too surprised if that happens.